An understanding of food is essential to healthy eating. The School Food Initiative invested in food literacy programs such as School Gardens, cooking demonstrations, high school food clubs, and elementary school salad bar hosts to help children and families understand where food comes from and how nutrition affects health and learning. The current generation of school aged children lacks not only cooking skills, but also food knowledge, because they don’t witness whole food being purchased, prepared, and served at home. Many elementary school students cannot identify foods as basic as a potato. School districts eliminated Home Economics classes that taught cooking skills, a fundamental component of food literacy. Given the limited amount of instructional minutes and large number of required lessons and standards to address, teachers resist the introduction of additional subject matter. Teachers regard food literacy as extraneous and burdensome, even though food literacy is the very model of cross-disciplinary integration promoted by newly adopted Common Core standards. As the Orfalea Foundation’s School Food Initiative (SFI) worked with food service operations to implement scratch-cooking and fresh salad bars, SFI funded a county-wide school garden program at elementary schools in order to help students accept the changing food on the plate. The program installed 36 gardens in elementary schools and paid for a dedicated Garden Educator to maintain the garden, teach garden-based lessons, and facilitate teacher use of the gardens as a multi-purpose instructional tool. Research now confirms that students involved in growing food and cooking it are likely to eat more fresh produce and be more adventurous eaters. SFI also funded a school assembly-based theatrical production called Food Play that conveyed the importance of healthy food choices while entertaining students interactively with acrobatics, humorous skits, and magic tricks. SFI also engaged a consultant to coordinate an school-wide hands-on cooking event called Jr. Chef, where all students participated in the preparation of a single dish and then sampled the dish the following day. SFI discontinued Food Play after post-program surveys revealed that the “one-off” aspect of the intervention did little to instill ongoing healthy eating behaviors. To better integrate the school gardens with other food literacy efforts, reinforce the concept of seasonality, provide multiple events during the school year, and benefit from the culinary and teaching skills of Chef Instructors, SFI morphed Jr. Chef into Chefs in the Garden, an interactive program based upon five core lessons adaptable from kindergarten to 6th-grade developmental levels. The Chefs in the Garden curriculum also engaged teachers with pre- and post-lesson worksheets and references to the grade-level standards covered in each lesson. SFI also enlisted School Nutrition Services directors, who are often responsible for nutrition education, to implement California’s Department of Public Health Harvest of the Month menu promotions and tasting. Connecting nutrition education and exposure to new foods in the cafeteria setting has helped students increase their acceptance of new fruits and vegetables. Nutrition Services directors liked the wide range of low- and no-cost Harvest of the Month marketing materials, the lessons of which were also adaptable by teachers for the classroom. On campus, Chef Instructors helped schools launch an elementary school Salad Bar Host program that trains fifth and sixth graders to help younger children at the salad bar, and a high school Food Club for students who wish to take an active role in improving nutrition and food literacy at their school. 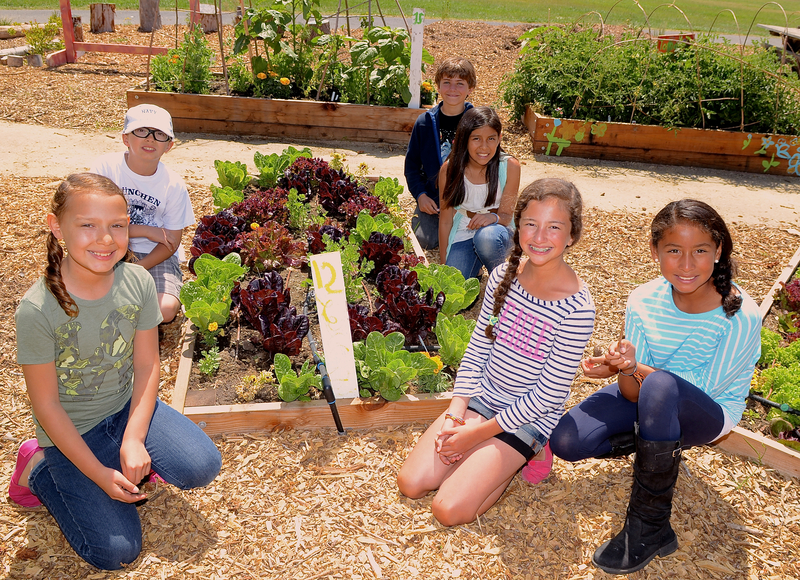 Food Literacy programs are underway at the majority of schools in Santa Barbara County. The Chef Instructors held a ‘Train the Trainer” session for the current cohort of school Garden Educators, teaching them how to implement the Chefs in the Garden curriculum as well as teach others, such as teachers or community volunteers, to conduct the lessons. SFI Chef Instructors have also worked to institutionalize the annual recognition and celebration of Food Day with teachers, principals, and Nutrition Services. Nutrition Services directors are actively sharing with their peers their positive experiences using Harvest of the Month materials. 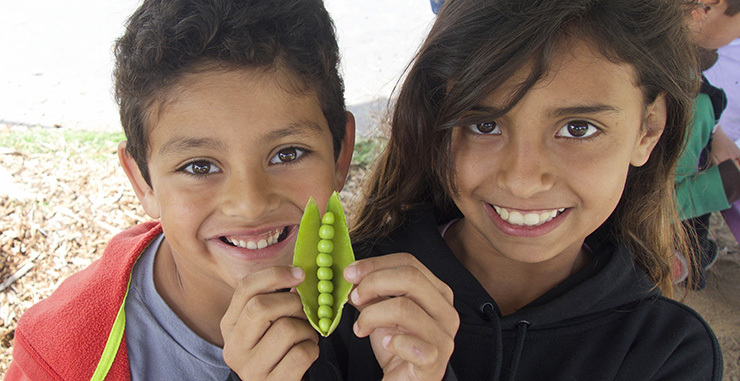 SFI funded the expansion of the Pink and Dude Chefs, an evidence-based after-school cooking and nutrition program developed by Cal Poly’s STRIDE Center, to six sites in northern Santa Barbara County. The Center for Science in the Public Interest is another great resource for more information.